All transactions are safe and secure with a reliable history in online purchasing behind each of our associates. Buy the Hannah Montana t-shirt to own Hannah Montana clothing and merchandise. The Hannah Montana photo on the front of this tee features the pop princess in one of her classic poses. She has her arms raised in the air and a smile on her face, as if she's just made eye contact with an old friend. "Oh my gosh! Where have you been?" exclaims Hannah. The friendly design on this tee is both fabulous and inviting. Old friends will feel at ease as you approach, even if their name is Rico. 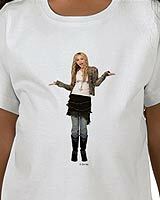 The design shown on this Hannah Montana clothing item is available on a variety of other garment styles. In addition to the Hannah Montana tee above, browse the Hannah Montana Clothing Gallery for more apparel like men's and women's clothes, kids shirts or hoodies.